Adenan bin Satem (27 January 1944 – 11 January 2017) was a Malaysian politician. He was the fifth Chief Minister of Sarawak from 1 March 2014 until his death. He was born in Kuching, Sarawak when it was under Japanese rule during World War II. Satem died from a heart attack on 11 January 2017 in Kota Samarahan, Sarawak. He was 72. 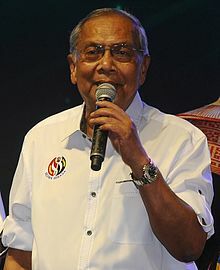 Wikimedia Commons has media related to Adenan Satem. ↑ Tawie, Sulok (11 January 2017). "Sarawak CM Adenan dies". Malay Mail Online. Retrieved 11 January 2017. This page was last changed on 11 January 2017, at 08:28.